On another note I saw a glimpse into Johnny's future yesterday. I was sitting in the family room while Alex was playing. She asks me for her water. I told her it was on the coffee table (only 5 feet away from her). Trying to see how much she can boss me around she told me to get it. I informed her to get it herself. She tried to ask again and I still said no. Then she says "Big Baby". Translated that means "When the Baby is Big". I said what is the baby (Johnny) going to do when he gets big. She responded with "My Water". I said "When the baby gets big he is going to get your water?" She quickly answered yes! Oh, poor Johnny. He has no idea what is coming to him! 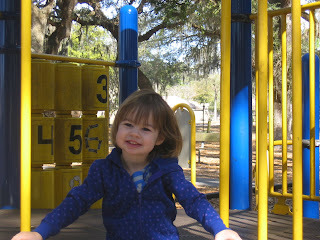 I am sorry that I have been slacking on keeping my blog up to date. Two kids keeps you busy!! Johnny is doing good. He will be two months this weekend. I can hardly believe it. I take him for his two month appointment on Monday. I can't wait to see how much he has grown. He continues to be a happy baby although he has decided that sleeping during the day is not fun and he would rather be up with his sister!! Alexandra is doing good as well. Busy playing mommy to her dolls. She is talking more and more everyday. She is now trying to make sentences. They are not proper sentences and often the words are not in the right order. For example, one I hear quite often is "All Done Feed Baby, Mama Hold". Translated that means "When Mama is all done feeding the baby, she'll hold me." I am going to upload some videos over the weekend and a new album of photos so check back the beginning of next week. I'll post again soon. Alex's cousin JJ visited last weekend with my sister and Mason. 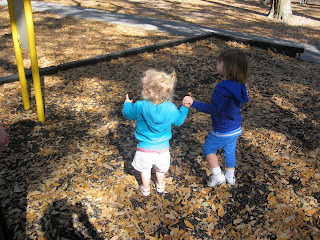 She loved her cousin and wanted to hold her hand all the time! 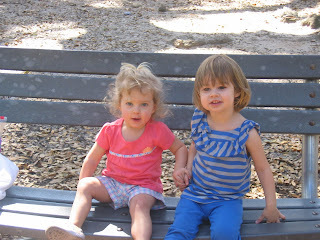 The two cuties at the park together. Alexandra seems to finally adjusted to having a brother. These past couple of days she wants to give him lots of kisses, hold him, put his pacifier back in, shake his bottle, rock him etc, etc. Its so cute. She is going to be a good big sister. Here is my little man. He is getting bigger everyday.